[New for 2013, discontinued] Last year, Blue Bunny released 4 Cadbury ice cream bars that went over very well here at On Second Scoop. They are a well made treat that is somewhat smaller but much healthier than any magnum bar you might come across. They've got two new flavors this year, and Blue Bunny was nice enough to send me the Royal Dark version (Nick will be reviewing the English Toffee Bars later). 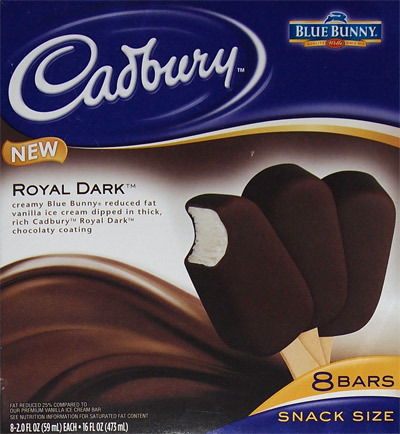 Here is a box of 8 Cadbury Royal Dark ice cream bars, each clocking in at 2oz a piece. 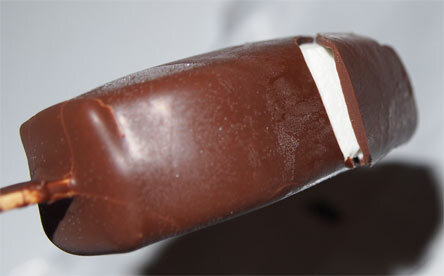 These bars are vanilla ice cream dipped in Cadbury Royal Dark Chocolaty coating. I do love dark chocolate! Why did I start this with a minor complaint? Because the rest of this treat is excellent. We're not dealing with some foo foo, super bitter dark chocolate. No, this is a real nice mild dark chocolate that works really well with the base vanilla ice cream. The chocolate is fun to crunch, but it's also melts quick when you try to savor it, giving you a nice chocolate coating on your taste buds. The biggest problem I had with this bar was deciding if I wanted to inhale it or try to savor it. On Second Third Fourth? Scoop: Every time I enjoy this bar, I get a different impression from the chocolate. It's always a good impression, but I want to describe it in different ways. A dark milk chocolate, a real quality (fun) chocolate, all kinds of nice words to describe a nice small treat that works anytime.